The MS community was lit up in Fall 2015 about the news of ocrelizumab and its use in treating primary progressive MS – there was excitement everywhere with the thought that finally a treatment for this form of MS had been proven effective. The bright focus of the headlines quickly waned and we did not hear anything about this wonder drug until this week’s announcement by the Food and Drug Administration that Genetech and Roche, that the manufacturers of ocrelizumab, have received Breakthrough Therapy Designation, and will seek quick approval. The public discussion of treatment options for people with progressive forms of MS had fallen to the wayside again until this week. I want to let those of you who have progressive MS know that despite the silence, there is work going on trying to find ways to make this form of MS better. 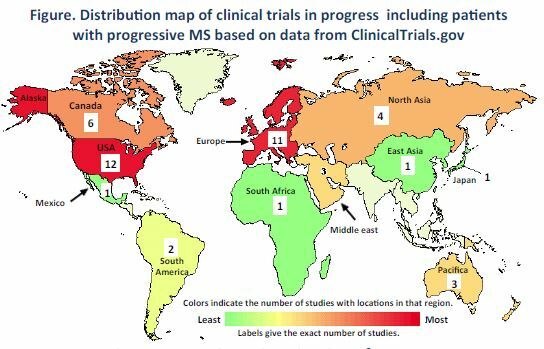 When the European Committee for Treatment in MS (ECTRIMS) met last fall where the big announcement regarding ocreluzimab was made, another presentation that caught my eye was Research trends in therapeutics for progressive forms of multiple sclerosis: A review of trials in progress and future prospects. Afsaneh Shirani, MD, was the lead on this project and kindly gives his permission to share the poster presentation that was given at ECTRIMS by the team from the University of Texas Southwestern Medical Center, Dallas. Their team reviewed all of the known progressive MS studies that are listed through clinicaltrials.gov and the number was woefully small. ACTH Anti-­‐inﬂammatory eﬀects (via modulation of regulatory T cells, inhibition of activation of NF-­‐κB, and possibly triggering CNS-­‐restricted release of noradrenalin, and acetylcholine). May have neuroprotective eﬀects in spinal cord injury and ischemic brain injury. Amiloride, Fluoxetine, Riluzole Amiloride is a K-­‐sparing diuretic capable of inhibiting acid-­‐sensing ion channels, a property linked to possible neuroprotective eﬀects. Riluzole, is an inhibitor of tetradotoxin-­‐sensitive voltage-­‐gated Na channels, with anti-­‐glutamatergic proﬁle. Fluoxetine is an SSRI suggested to have neuroprotective properties by suppression of microglia activation, and NF-­‐κB activity, and enhancement of the production of the brain-­‐derived neurotrophic factor in animal models. Anti-­‐LINGO-­‐1 (BIIB033) Leucine-­‐rich repeats and Ig-­‐like domains containing neurite outgrowth inhibitor receptor–interacting protein-­‐1 (LINGO-­‐1), a cell surface protein expressed in neural cells, and negative modulator of axonal myelination via inhibition of the diﬀerentiation of oligodendrocyte precursors to mature oligodendrocytes. Biotin (MD1003) Essential micronutrient, cofactor for decarboxylase enzymes, high doses of biotin found to prevent the progression of ‘biotin responsive basal ganglia disease’ characterized by subacute encephalopathy of childhood onset with extrapyramidal and pyramidal manifestations. Domperidone Dopamine-­‐2 receptor antagonist which increases prolactin secretion (as a side eﬀect). EAE studies suggest that prolactin can promote myelin repair. Erythropoietin Hematopoietic growth factor, shown to have anti-­‐apoptotic, anti-­‐oxidative, anti-­‐inﬂammatory, neurotrophic and plasticity-­‐modulating eﬀects in animal models. Hematopoetic Stem Cell Therapy Presumably eradicates the autoreactive cells, resets the aberrant immune response to self-­‐antigens, and possibly promotes regenerative processes in the CNS. Ibudilast Non-­‐selective phosphodiesterase inhibitor suggested to have immunomodulatory, and neuroprotective eﬀects by inhibiting leukotrienes and NO synthesis, and reducing TNF-­‐α from astrocytes and microglia. Idebenone Synthetic analog of coenzyme Q10, endogenous antioxidant found in all cellular membranes, and a constituent of the ATP-­‐producing electron transport chain of mitochondria. Beneﬁcial eﬀect in some mitochondrial disorders such as Friedreich’s ataxia and Leber’s hereditary optic neuropathy. Lipoic acid Natural antioxidant with signal transduction modulatory pathways, suggested as a potential therapeutic agent in diseases associated with oxidative stress . Lithium One of the oldest anti-­‐psychotic medications, inhibits glycogen synthase kinase-­‐3 (GSK3), a serine-­‐threonine protein kinase and major regulator of inﬂammation. Masitinib Selective tyrosine kinase inhibitor, modulates migration, survival, and degranulation of mast cells which are suggested to play a role in MS pathogenesis by releasing vasoactive mediators that sustain inﬂammatory cascade, disrupting blood-­‐brain barrier, and stimulating activated T cells. MIS416 A myeloid-­‐directed microparticle immune response modiﬁer (derived from Propionibacterium Acnes) suggested to modulate T cell-­‐mediated autoimmune responses by simultaneously activating innate Toll-­‐like receptor 9 (TLR9) and nucleotide-­‐binding oligomerization domain-­‐containing protein 2 (NOD2). Natalizumab Humanized IgG4 monoclonal antibody that targets the α4-­‐chain of α4β1 integrin and other α4-­‐integrin-­‐ containing adhesion molecules, thereby inhibiting the adhesion of lymphocytes to the endothelium and blocking lymphocyte extravasation into the CNS through blood-­‐brain barrier. NeuroVax A trivalent T-­‐cell receptor (TCR) peptide vaccine, shown to induce a surge of proliferating IL-­‐1-­‐ secreting TCR peptide-­‐speciﬁc T cells concomitant with restoration of deﬁcient expression of FoxP3 (forkhead box P3, an important transcription factor in the development and function of regulatory T cells). Oxcarbazepine Blockage of voltage-­‐gated sodium channels, thereby possible neuroprotective properties by preventing cascades of degradative enzyme activity that ﬁnally leads to axonal degeneration. Ocrelizumab Humanized IgG1 monoclonal antibody against CD20 B cells with fewer anti-­‐idiotypic reactions than rituximab. Rituximab (combined IV and intrathecal) Chimeric IgG1 monoclonal antibody against CD20 B cells. Siponimod (BAF312) Modulator of sphingosine 1-­‐phosphate (S1P) receptor that acts selectively on S1P-­‐1 and S1P-­‐5, demonstrating greater selectivity than ﬁngolimod. Sunphenon ECGs Epigallocatechin-­‐3-­‐gallate, a major constituent of green tea, suggested to have neuroprotective eﬀects by acting as a free radical scavenger. Tcelna (Imilecleucel-­‐T) A T-­‐cell immunotherapy consisting of an autologous pool of T-­‐cell lines raised against selected peptides derived from myelin basic protein, myelin oligodendrocyte glycoprotein, and proteolipid protein. The number of agents being investigated appears lengthy but the reality is these studies will only enroll about 6,000 people. Dr. Shirani writes that this data needs to be updated because so much more is now happening in the study of progressive MS and I’m hopeful the news from ACTRIMS Forum 2016 will include not just more flashy headlines but meaningful news. Stay tuned ….